The soup looks fabulous served in a ‘squash bowl’. In a large saucepan on medium heat, sauté the shallots in olive oil until translucent (approx. 5 minutes). Add the cubed butternut squash, continue to sauté for 3 minutes then add the cubed carrots. Season with sea salt and white pepper. Add your vegetable, chicken stock and boiling water. Increase the heat and bring the soup to boil for 3-5 minutes. Reduce the heat to medium and cook for 40 minutes (if you find there is a lot of broth on the top, using a large spoon you can skim this off). Remove from the heat and cool slightly. 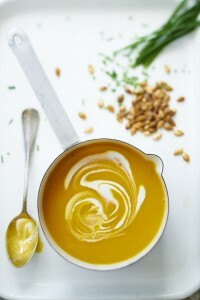 Using a hand-held blender, purée the soup in the pot, or purée in batches in a blender or food processor. If the soup is too thick, add a little extra boiling water. Garnish with coconut yogurt and chives. To make the squash bowl, cut a butternut squash just beyond the bulbous part of the squash where it meets the neck. Using a spoon, scoop out the seeds. Preheat the oven to 350°F, gas mark 4, 180°C (160°C fan-assisted). Line a baking tray with parchment paper, place the butternut squash on the tray, and drizzle olive oil over. Sprinkle with sea salt and cracked black pepper. Roast the butternut squash uncovered for 40-50 minutes. Serve your soup in the squash. Lisa has just published her first book, My Relationship with Food, which features 100 delicious recipes, each mirrored by beautiful photography. All the dishes are virtually gluten-free and see minimal use of dairy and refined sugars. The recipes are seasonal, helping you make the most of the best produce available to create nourishing meals. Perfect for those wishing to build on their repertoire, introducing you to some inspiring breakfasts, lunches, soups, sides, dinners and treats.